I remember my first trip to the border. Had to be around 1984. Nuevo Laredo with my brother. We pointed my old Landcruiser south and drove until the signs forced us to stop. “Little kids are going to try to sell you Chicklets,” my brother said. I didn’t make any pictures that day as this was before my venture into photography, but what I did do was really look around. I mean REALLY look around. “La Frontera” is unique to this world, and the border has a magic that transcends normal life. The border is a transition point for all kinds of things. Billions of tons of cargo move through border choke points on a yearly basis. We all know what comes and goes. Things that make us feel, things that go bang and things that have DNA. It’s always been this way. The border has changed in the past few decades. You’ve probably seen a story or two, but what is the border REALLY like? Don’t ask me. I quit going after getting jumped in Tijuana a few years ago. Getting out of that was my “free pass,” in my mind, only available to me due to some past good deed I can’t identify. In fact, one of the things you will probably never see me do again is prowl around the border with camera and pen. But luckily I don’t have to because Ed Vulliamy is already doing it. Ed doesn’t dabble in the border, no he goes all the way from TJ to Matamoros. Both sides. Asking questions. Snooping. 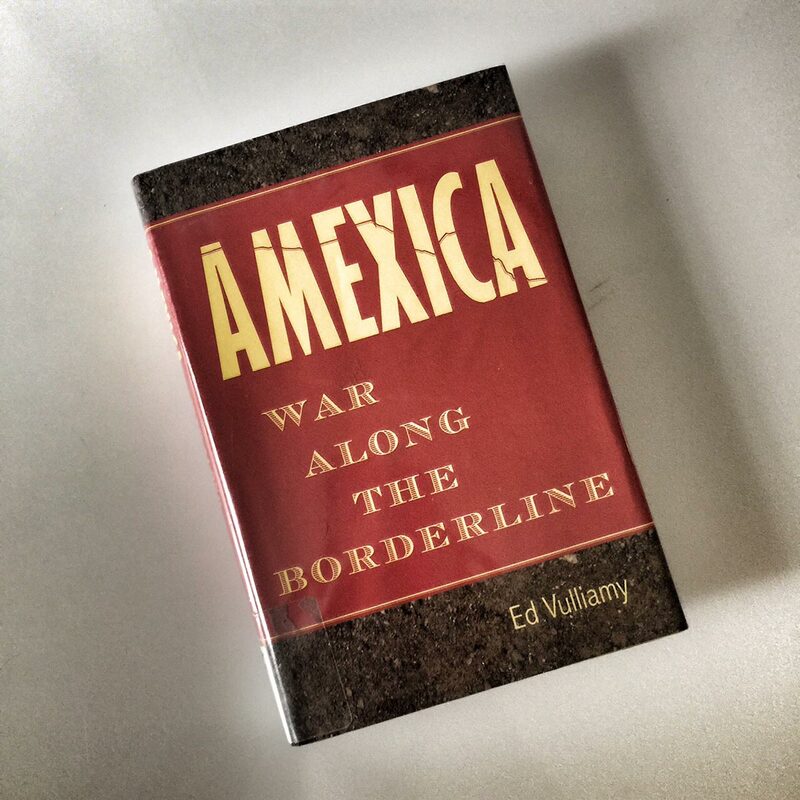 But this book isn’t an expose´ it’s an on-the-ground history that reveals how much has changed for our Mexican neighbors, and how entwined we are with what happens down south. Having lived most of my life in border states, and reading everything I can find on the border, I find the entire scenario fascinating, but yet another topic that gets lost on most Americans. Out of sight, out of mind. Just give me my cheap, ceramic Bart Simpson figure and I’ll be fine. How about a surf at K21? Cheap lobster taco? As Americans we have the option of filtering our Mexican experience. We can walk across and walk back. No need to avoid Grupo Alpha, or need to sell everything we have on a life changing roll of the dice as we leave our family to find work in El Norte. One thing that jumped out at me from Ed’s book is the changing face of the maquiladora and the export of business to China. Thousands of factories have closed, leaving thousands out of jobs. An increase in drug consumption on the Mexican side, something that has really exploded in recent years, and unparalleled violence against women, especially in Ciudad Juarez(Where I made my first reportage on the border in 1990). I’m not sure why, but when I read books like this I feel a sense of hope more than anything else. The border has been dealt a tough hand, no doubt, but things MUST change at some point. It could get worse before it gets better, and the demand for drugs in the United States, a major part of the problem, doesn’t appear to be slacking off anytime soon. But at some point all of us are reduced to the fact that we are all humans. We all have families we need to support, contributions we need to make and peace to attain. This review isn’t really a review, and isn’t doing this book justice. Read it for yourself and understand the amount of work and fortitude required to bring this piece back from the places where asking questions can get you killed. Viva journalism, real journalism. I lived in Las Cruces for one year. 1993. I remember the view across the river from El Paso. It looked like a bombed out village back then. Thanks for the pointer! Got a hold on it at the library now! Stay tuned, three more border books on the way. Yes, the first time you see that view from El Paso into the Colonias on the Mexican side it’s a “whoa” moment. I still get it when I pass through.